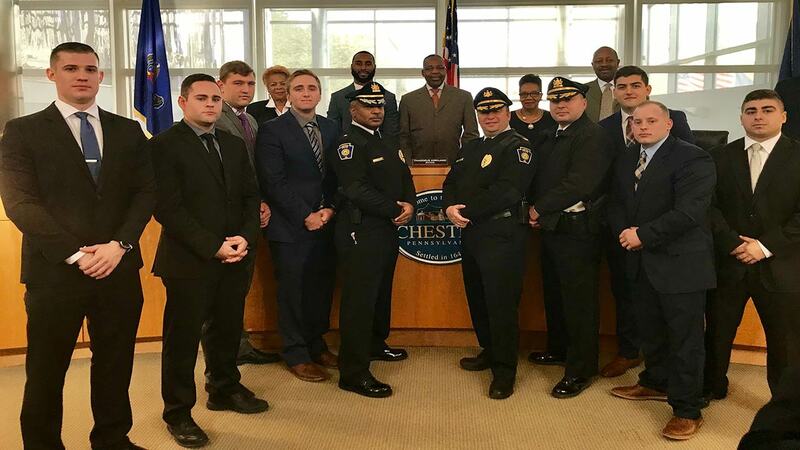 Seven new officers were sworn-into the position of patrolman in Chester during the first council meeting of 2019 on Wednesday, January 9. The seven new officers will begin patrolling the community alongside a tenured officer over the next several weeks. "The field training process has already begun for these men," said Police Commissioner Otis Blair. "Our commitment is to ensure that we are hiring viable candidates who are well-trained and equipped to serve the community of Chester." Congratulations to officers, Joshua Disylvestro, Eric Bergman, Joseph Benning, Sean Mullen, Zachary Litvinenko, and Andrew Pownall.